TOKYO (Sputnik) – The Japanese parliament ratified the EU-Japan Economic Partnership Agreement (EPA), opening the way for the creation of a free trade area covering around 30 percent of the global Gross Domestic Product (GDP), local media reported on Saturday. The deal was backed by the upper house of the Japanese parliament on Saturday after the lower house endorsed it in late November, the Kyodo news agency reported. The outlet noted that if the deal is ratified by the European Union by the end of the year as planned, it will be effective starting February. 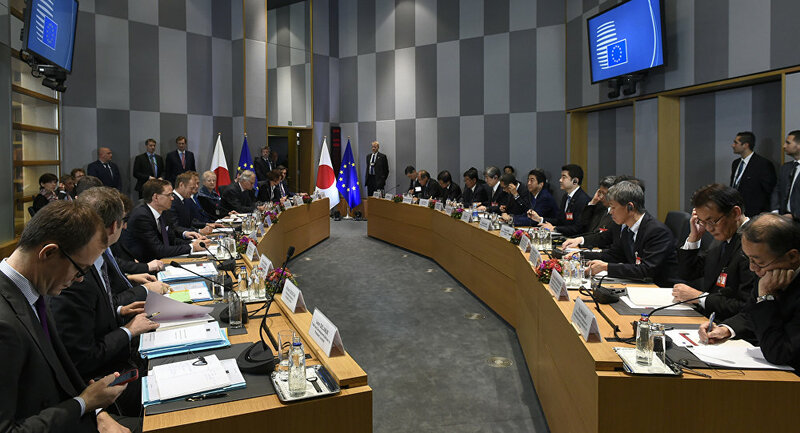 Under the deal, the European Union will abandon import tariffs on around 99 percent of Japanese goods, while Japan will abolish the duties on around 94 percent of EU imports, receiving access to cheaper EU goods, such as cheese, wine and pork, according to the outlet. Tokyo and Brussels engaged in negotiations on the EPA in 2013 and reached the agreement in July 2017.